Tami, a 59-year-old hippopotamus, passes away at Jerusalem's Biblical Zoo. Tami, believed to be the oldest hippopotamus in captivity, died on Thursday at the age of 59 in her sleep at Jerusalem's Biblical Zoo, the zoo announced. She was found dead in the lake of the African-themed area where she lived in the zoo run by Israeli authorities in Jerusalem, a statement said. She was "the oldest hippopotamus living in a zoo," it said. "She died at an advanced age, surrounded by lots of love and respect." She was the last hippo at the zoo after the death of Mati, a male, some 10 years ago. Tami had quickly established herself as dominant among the giraffes, zebras and rhinos in the African area, it said. "It is a difficult day for us," zoo employee Gilad Moshe told the Yisrael Hayom newspaper. "A little like losing a friend." In July 2017, Bertha, believed at the time to be the world's oldest hippopotamus in captivity, died aged 65 at Manila Zoo in the Philippines. 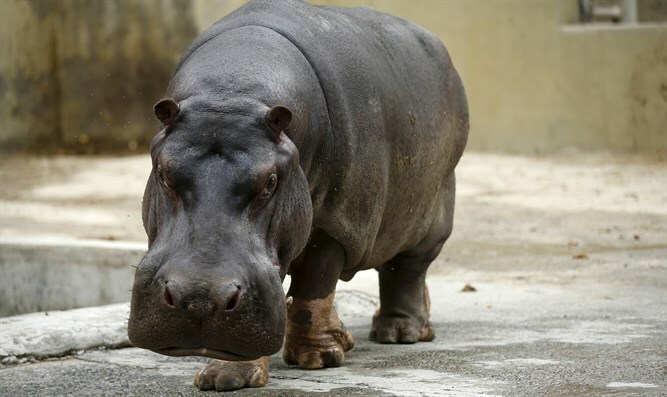 Prior to that, Donna, who died in 2012 at the age of 62 at the US Mesker Park Zoo and Botanic Garden in Evansville, Indiana, was said to be the world's oldest hippo, according to media reports at the time. Hippos tend to live for between 40 and 50 years. The mostly herbivorous and semiaquatic animals are found in central and southern Africa. Jerusalem's Biblical Zoo was founded in 1939 and contains some 250 species, most of which are named in the Bible.